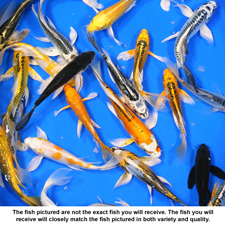 Popular and hard-to-find varieties (Platinum Ogon, Showa, Shusui, etc.) may be more prevalent in the Premium Grade Butterfly Koi. Available from 5 to 6 inches.